Everything about Nick of Time shrieks 'straight to video'. The Columbo style titles at the beginning. The muted primary hues of the colour palette. The somewhat unglamorous setting. The utterly ludicrous plot. Everything, that is, apart from the cast. 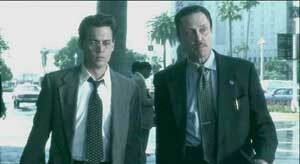 Where else would you find the lovely Johnny Depp cast opposite everyone's favourite unhinged villain, Christopher Walken? (Er, apart from Sleepy Hollow, of course.) And then it's directed by John Badham, the man who brought us Saturday Night Fever and that 1970s version of Dracula that looks as if it's set in Citizen Smith's house. Surely with such stars on board, this film can do no wrong? At the start of Nick of Time, deranged psycho Christopher Walken and his trusty sidekick, Liz from Nip/Tuck, are surveying the concourse of a busy Los Angeles station. They are looking for a victim. Not a victim to kill, but a victim to kill someone else for them. They pick Gene Watson (aka Johnny), arriving in town with his small sassy daughter in tow. In order to prevent her death, Johnny must shoot the Governor of California (sadly not Arnold Schwarzenegger - now that would be a film.). Desperate to save his daughter, Johnny agrees, and thus ensues a race against time as he tries to foil the dastardly plot and save the day. Christopher Walken is, as ever, on top starey-eyed, mad-haired form (even if you do keep expecting him to leap into the hotel lobby and start dancing like Fred Astaire), playing yet another variation on the scary, unhinged hitman he does so very, very well. And just as the Devil gets all the best tunes, he certainly gets all the best lines, some of them even bordering on the Tarantino-esque - the speech about his Irish friend, for example, is classic Walken cool. As for Johnny, bizarre as it is to see him in this kind of daytime TV action film, the casting works surprisingly well. Were Watson to be played by Steven Seagal or Jean Claude Van Damme, it wouldn't take a genius to work out that the bad guys would be about to get their butts kicked big time. Johnny's Watson, on the other hand, staggers around the Governor's hotel looking dazed and confused and frightened, pausing every so often to throw up as he contemplates the task ahead of him. You can't really see him erupting into a sudden whirlwind of kung fu fighting. And it has to be said, his task looks pretty damn hopeless. Not only is the Governor's entire security staff in on the plot, but her husband is actually orchestrating it. Quite why they need Watson is a bit of a mystery, especially as any CCTV footage from the hotel would plainly show him being constantly bullied by Walken's evil genius. The CSI team would have got to the bottom of the murder in minutes. Watson, of course, is not quite as useless as he first appears. He might not be able to fire a gun, but he's not stupid, and, with the help of Charles S Dutton's rather marvellous war veteran shoeshine guy, Huey, he sets out to save the Governor and his daughter and, er, the day. And as the clock keeps ticking, we can try and get excited about the whole thing. 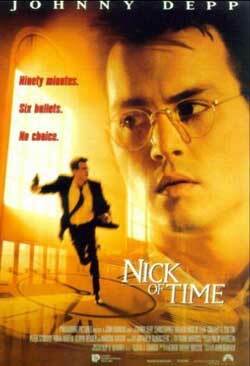 Nick of Time is not a bad film, but neither is it Johnny's finest hour (or hour and a half). It's based around an interesting idea, it holds the attention well enough (filmed in real time, it generates a fairly convincing sense of tension as Watson's deadline approaches) and it features some great performances from Johnny, Walken and Charles S Dutton. 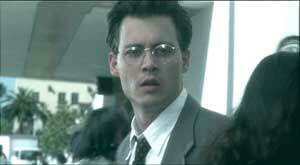 Certainly it's not a typical Johnny film - more like something Keanu Reeves would be in before The Matrix happened - and although he makes the most of the role of Watson, it doesn''t entirely suit him. Apparently he took on the part because he sympathised with the idea of a father who would do anything to save his child. Oh, and he needed the money.